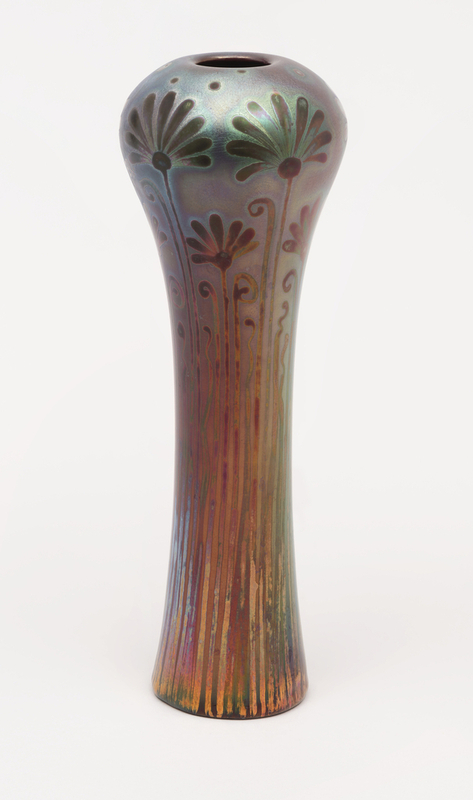 This vase with its shimmering colors and fluid lines was designed by Jacques Sicard for the Weller Pottery between 1902 and 1907. It was created using gray-white clay and is finished with an iridescent glaze that captures a multitude of colors. The unusual form is tall, slender and slightly cylindrical with bulbous shoulders, with an in-turned rim and no foot. Sicard’s design style falls firmly in the realm of Art Nouveau, drawing inspiration from nature by utilizing a highly stylized rendition of carnations to encircle the whole form. The stems and blossoms extend the length of the vase emphasizing its verticality while the fanned blossoms along the top stress the swelling bulbous shape of the shoulder. Scattered dots add interest while filling in empty spaces. The words “Sicard” and “Weller” both appear in stylized script that blends in with the stems and floral flourishes. Weller Pottery was established in Fultonham, Ohio by Samuel A. Weller, in 1872, moving to Zanesville, Ohio between 1882 and 1890. The firm’s production began with flower pots, bowls, crocks and vases, and by 1905 Weller Pottery was one of the largest ceramics firms in the country. Weller’s art pottery was produced until 1920 and the business retained its commercial line until closing in 1948. In 1893 Weller was influenced by William Long who displayed faience pottery at the Chicago World’s Fair. Weller purchased Williams’ business, Lonhuda, and together they established a line of faience for Weller Pottery. Faience is a fine tin-glazed pottery made of delicate pale buff earthenware with a high shine finish created by the addition of tin oxide to a basic lead glaze. The resultant two lines, Lonhuda and Louwelsa, are characterized by their brown hues and high gloss finishes. In time Weller’s Louwelsa would become available in 500 shapes and sizes. In 1901, Weller brought two Frenchmen, Jacques Sicard and Henri Gellie to Ohio to develop metallic lustre glazes for the pottery. Both men worked under Clément Massier, a master ceramist, in Golfe Juan, France. Together the developed a line that was marketed as Sicardo. Sicardo pottery is identifiable by its stylized floral motifs painted on simple forms. The iridescent finish was achieved by painting a metallic, ochreous mixture over a fire copper glaze. A second step involved exposing the pottery pieces to a reducing fire. The firing process and high temperature required to achieve the effect proved to be a challenge, resulting in a limited number of pieces produced. Sicard and Gellie worked for Weller for five years, between 1902 and 1907. The two designers returned to France at the end of their five year contract, leaving Weller with a stock of Sicardo ware that was sold thereafter. This object is currently on view in Iridescence.